The Planet Hollywood in Niagara Falls, Ontario CANADA is located on Falls Avenue, in the heart of Niagara, by Clifton Hill and literally beside the Rainbow Bridge connecting Canada and the U.S.A. This popular themed restaurant is well known across North America for its Hollywood themed memorabilia decorating its walls & ceilings. The popular restaurant swaps prop items with other Planet Hollywood locations in North America making a guest’s repeat experience even more enjoyable since there is always something new to be viewed. What also makes the Planet Hollywood a great restaurant is the fact that they will allow you to come visit without a reservation, in fact go visit even if your don’t plan on staying for their fabulous California inspired menu, you can explore the restaurant and view the timeless stage and screen items. This is the place to be for an experience that will rock all of your senses! At the Hard Rock Café in Niagara Falls, Ontario you can view timeless, rare pieces of rock & roll memorabilia, set to the backdrop of some of Rock & Roll’s most famous (and infamous) musicians & groups from every era of Rock’s history! Located on Falls Avenue, you will even find a specialty room dedicated specifically to “The King” Elvis Presley. It’s quite the walk down memory lane watching familiar videos, viewing your favorite band member’s actual instruments played at venues you may have been too yourself. Be sure to check out profound quotes from the likes of many of Rock Music’s most remembered, like Jim Morrison, Eric Clapton or John Lennon, just to name a few. Let’s not forget the popular American style menu with all your favorites, including staples like cheeseburgers, fries, sandwiches, gourmet salads, appetizers, and of course your favourite cold beverages served from the iconic 80ft Guitar Bar. Now talk about fulfilling your senses, this themed dining establishment not only has the visual and audio experience to make for a great visit, but also includes a thunderstorm every 20 minutes with lightning and rain to make it a truly one of a kind adventure while enjoying a safari jungle-themed menu of all of our favorites. 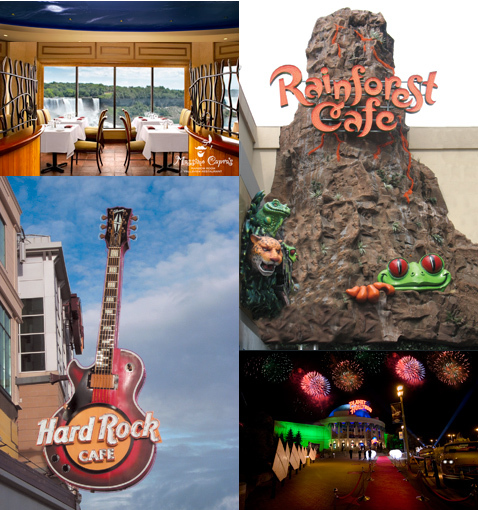 The entrance to this location, which is on Clifton Hill, is ideal for the shopper in the family looking for exclusive Rainforest Café souvenirs including items that feature your favorite Rain Forest animal to cute stuffed animals, endearing yourself to that special someone. Be sure to check out the Live Shark or Reptiles while your there. Don’t Knock on the Glass! This dining gem is located within the luxurious Crowne Plaza Hotel Niagara Falls – Fallsview a Niagara Falls Hotel with a rich history in the Niagara Falls area, which has been frequented by many celebrities over the years. While not themed dining like some of the other options on the Falls Avenue Resort, Massimo Capra’s Rainbow Room Fallsview Restaurant carries celebrity cache of its own in renowned Chef Massimo Capra. Most often recognized as the host of Food Network Series “Restaurant Makeover”, Capra and the Crowne Plaza culinary team have designed a menu using a fresh market approach that results in the rich ingredients produced in Niagara in the spotlight. The Rainbow Room’s exquisite fine dining and spectacular view of the Falls is an experience not to be missed.